Shotgun Wedding has sprung to life with their new record, South of Somewhere, which is out today. The group made up of Dennis DelGaudio, (guitar/vocals), Wade Preston (piano/vocals), Catherine Porter (vocals), Andy Cichon (bass/vocals) and Chuck Burgi (drums) have all been significant players within the music scene throughout the past several years. To boot, several of the Shotgun Wedding crew has played in the Billy Joel band throughout the years; even appearing in Movin’ Out on Broadway. This time around though the group ventures out into a musical adventure all of their own; where everything and anything is fair game. 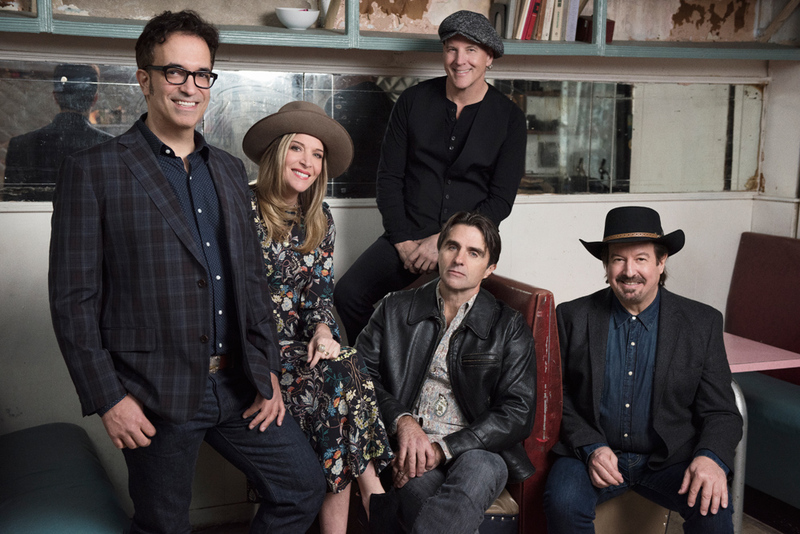 The band takes their love of Southern, Country and Americana music, and intertwines the elements with a Classic Rock sound that will entice your ears. Often compared to the likes of Little Feat, Zac Brown Band and Asleep at the Wheel, Shotgun Wedding bring their own musical palette to the table which proves to be outstanding in each song. The instrumentation right from the start melds together perfectly, setting the tone for the entire record. DelGaudio’s voice is strong and prominent, bringing the songs to life, and when joined by Porter, the band is unstoppable. Opening track and lead single, “City Boy,” enters with harmonious vocals and twangy guitars that will already captivate you. Entering the blissful piano playing, and charming rhythm section, the group goes above and beyond to create music perfection. It took two years to write and record South of Somewhere and the band’s effort and attention to detail shine through. Porter takes center stage for “The Answer,” which truly showcases her gorgeous voice. With the rest of the band backing her up, they provide a soulful blend of piano tones, harmonies, and even fiddle. Though Shotgun Wedding can be deemed as a Southern band, their music really speaks volumes, which will have them appeal to a lot of listeners. “Broken,” which has Preston bringing his vocal styling to the table, is backed up by heavenly background vocals to accompany his nitty-gritty sound. Guitars intertwine throughout with impeccable solos that fill every inch of space in the song. You don’t get only an album with Shotgun Wedding; you get a full live experience. Standout tracks such as the tear-jerking “Just One Minute,” features dueling vocals that meld together brilliantly, as the title track “South of Somewhere,” brings us on a stunning journey to the South. The album bursts with a vibrant energy within jaunty tracks such as “Skeeters” and “Down in Flames,” as the piece “Lies Crying,” brings a more somber tone to the record. From start to finish, it is obvious that Shotgun Wedding put their entire heart and soul into this record. South of Somewhere doesn’t only put the group on the map, but it secures Shotgun Wedding’s mark in musical history.